This is the first of several locked room mysteries. Being a nuclear bunker set into a cliff this is probably the most secure room of all, but in these cases the answer is usually inside already. 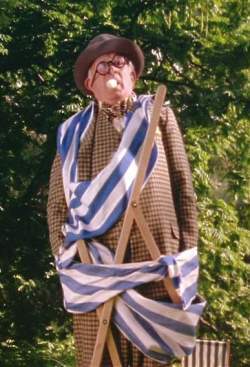 An old guy in a brightly-lit park has various slapstick accidents involving a deckchair, ogling a pretty girl, and a banana skin. It's a rather silly an advert for bananas. Jack Holiday (played by John Bluthal, who also played Frank in the Vicar of Dibley). A cheesy old comedian whose dated humour and slapstick performances are no longer popular. Jack was found shot through the head, on his own, locked inside his nuclear bunker. Suicide surely? His current wife insists he couldn't possibly have shot himself as advanced arthritis meant he couldn't possibly pull the trigger. This is later backed up by an ad director who was working with Jack, the comedian needed a stunt double just to peel a banana. Alan Rokesmith, who was jailed for the murder of Jack's first wife 9 years previously, was just released after his conviction was overturned. Kirsten Holiday (Jack's second wife) believes that Rokesmith somehow murdered Jack. Maddy reckons that it was suicide, and that Jack had some kind of device that allowed him to pull the trigger. She suggests it wasn't found with his body because it was on elastic and went down the waste pipe of the toilet. Jonathan points out there wouldn't be any reason to do that if he was simply committing suicide. There are many easier ways Jack could have killed himself. I watched the first series of Scandal, a US show that aired in the UK a few months ago. I've been a bit slow to write it up. When I first saw the adverts it looked like a lawyer show with a political backdrop. Though it turned out to be more of a political drama/thriller. While many of the main characters are lawyers (or presumably have legal degrees) there's no courtroom drama. The show doesn't fit comfortably into any particular generic box, which is mostly a strength as there's no need for it to follow conventional storylines. 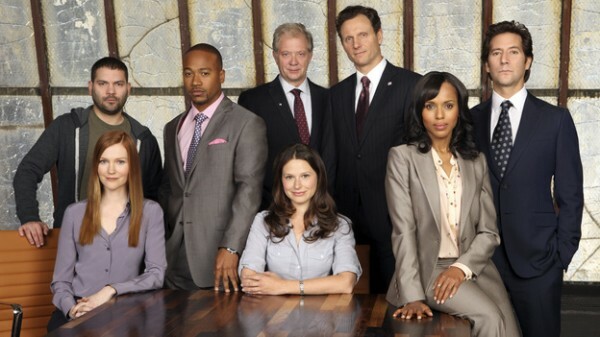 Olivia Pope used to work for the White House and was a major player in President Grant's campaign. Now she runs a private agency that discreetly and efficiently solves problems for very wealthy clients. The team includes a few lawyers, a private investigator and an IT/security expert. The problems they deal with largely mean intervening to ensure that clients interests are protected and their secrets are kept out of the public eye. Running alongside the Problem of the Week format is an arc about a White House affair and a conspiracy to discredit the President. 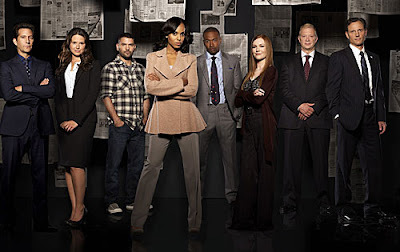 I enjoyed Scandal, despite being regularly irritated by some of the production decisions and feeling decidedly lukewarm towards some main characters. I suspect it was concept, the good characters and the conspiracy plot that kept me hooked. The reveals were well paced and there were both character and plot beats that surprised me, in a good way. 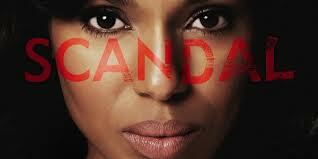 Olivia Pope is clearly the main force in the show and it's good to see a female character in that position. I can't fault the performance or the character. The only issue is that the show seems to be a little too in love with her. 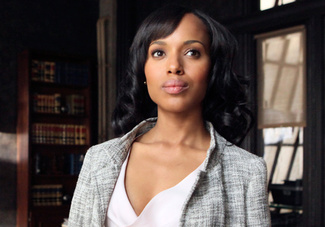 She has this huge, powerful reputation and the way that all the other characters go on about Olivia Pope, Olivia Pope (she does not look through a telescope)* makes her seem magic and therefore a bit unrealistic. Until you have a scene actually featuring Olivia (which is the bulk of them), at which point you again realise that she is human and vulnerable and badass and awesome. Isn't it odd how posed TV publicity photos can be? As though the characters are in a school picture. Olivia's firm are introduced to the audience through Quinn, who is recruited in the first episode. I'm not quite sure why she's there, except to have other characters explain things to her, look shocked about stuff, and give people hot drinks when there are problems. She does have a Big Secret Past, so I assume she's going to get more interesting in series 2. There are 2 male lawyers whose names I don't remember. British lawyer is a womaniser who's trying to reform. As well as lawyering, his job is to be inexplicably irresistible to women, gather information, and receive stern looks from female colleagues. He has a fiancee we barely see, I feel bad for her. American lawyer's job is to appear cool and badass while questioning people or giving pep talks, and to big up Olivia's rep as much as possible. 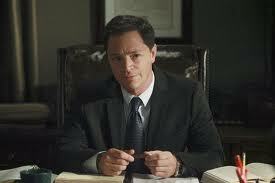 I think he also does some lawyering. Huck, the technician, is a good character. He's clearly the IT expert, but is in no way geeky. In fact he's dour and taciturn with an intense physical presence. He's also the securities expert and is obviously ex-military (or something). He displays a caring side but it's clear he can be dangerous. We don't find out how dangerous until later in the series, but his is the most interesting and surprising backstory (presumably until Quinn's secret is revealed). Then there's Abbie, the outspoken, liberal private investigator. I feel as though I ought to really like Abbie as she clearly has many of the same views as me, but I don't. She's OK, but I didn't feel a connection with her. I think it's the way she reels off a disapproving litany of Bad Things about a person or situation -many of these things (homophobia, corruption, misogyny, rich & privileged folk making life hard for others) are definitely bad and I too disapprove of them. Perhaps the issue is that she says these things with impassioned conviction, then gets on with her job of helping the rich clients keep the status quo in tact. That said there are episodes where she has her way and is able to act for the greater good, though it's usually Olivia who actually sets those outcomes in motion. Special mentions go to Cyrus, the openly gay Chief of Staff to a Republican President (it took me 3 episodes to realise President Grant was Republican) who can be charming and incredibly ruthless. There's also the long-suffering Washington DA played by West Wing-alum Joshua Molina, who sees Olivia as both an ally and a major thorn in his side. I'm not the sort of person who tends to notice technical decisions in TV shows, though I appreciate they're important. So it's probably a big deal that I found myself regularly annoyed by camera angles and scene changes. Almost every internal scene was filmed through a window or glass door, often ones that were wobbly or frosted. Olivia's offices contain frosted glass dividers and it seems as though the camera loved the things, often panning around them so that speaking characters were temporarily hidden from sight. It's a good thing that there isn't more glass in the White House, meaning there was some respite from it in those scenes. I think the show was going for a unique and interesting visual style, possibly one suggesting covert surveillance/observation. Though I wouldn't be surprised to hear that a glazing firm stumped up some money. Either way, the end result appears to be a conviction that large sheets of glass separating the action from the audience are a Good Thing. The irritating scene changes happen at least twice in each episode, except for the flashback episodes (which I enjoyed). These were a rapid series of location shots, almost too quick to register, accompanied by the traditional shutter-click noise of photos being taken. Again this was a decision clearly intended to create a distinctive style, which it did. It could have been another indication of covert surveillance (which probably isn't best achieved by noisily taking photos from behind glass), although there wasn't much of that in the action. Maybe it was meant to summon images of story-hungry paparazzi, and associated trial by media, which was often the threat hanging over characters. The quicker this photo is taken the quicker we can all get back to class. I'm interested to see what the second series is like. I'm really looking forward to seeing what happens next and how Olivia and others will handle it. I'm hoping that I'll warm to the characters I'd didn't get on with. It sounds as though British lawyer isn't in season 2, so that's one down. * Me and my husband initially made hilarious (to us) references to rhyming picture book Shark in the Park by Nick Sharrat, which has a main character called Timothy Pope, who also has a telescope. We probably would have stopped our childish giggling sooner if it weren't for the fact that characters constantly refer to Olivia by her full name, bringing the word telescope to our minds every time. Today I went to a local exhibition of art from the Government Art Collection and attended a talk about the exhibition given by one of the Government curators. I'm not particularly an art fan and don't consider myself knowledgeable about art (except for some Ancient Greek stuff). However one of the nice things about art is that you can go and look at it and see what takes your fancy without having background knowledge. I do like to learn things and the talk was certainly good for that. The exhibition was divided into 5 parts, all displaying a variety of different pieces. Mostly paintings, but also photography, sculpture and video, spanning about 5 centuries. This is the first time pieces from the Collection have been brought together like this as the art is used for display in Government buildings and Embassies. I've put images and my thoughts under the cut. It's a holodeck episode, which means things are going to go horribly wrong. However they're going to go horribly wrong while people wear amusing costumes, and in this case there's also various hats. It turns out I will forgive/ignore a lot where amusing hats are involved. Over Christmas I saw the Rex Harrison Doctor Dolittle film, and though it was sexist there was briefly a dolphin wearing a top hat (it is a very strange film). 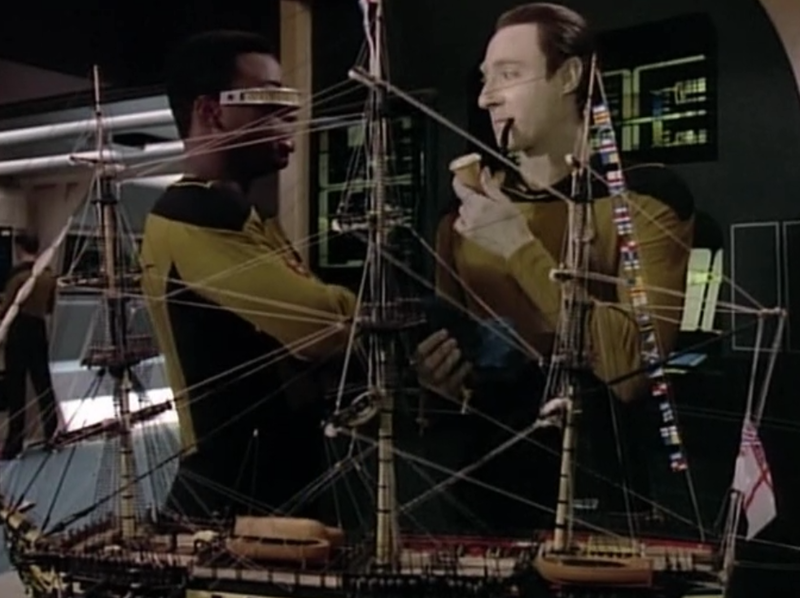 Geordi calls Data to Engineering to look at the model ship he's built. Then Geordi suggests they do something relevant to Data's interests and offers to be his Watson. They reconvene at the holodeck in Victorian costumes, including amusing hats! 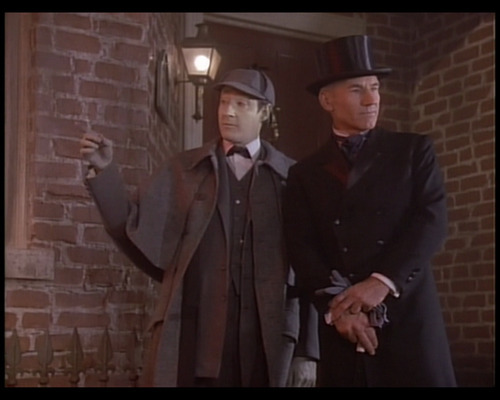 Every holodeck scene from now on is full of period costume and slightly overdone Victorian London. In Holmes' study, Data rushes around touching things, then solves the mystery in a few seconds. Geordi, who's playing along but isn't haven't as much fun as he'd expected, leaves. Later, in 10 Forward, Geordi explains to Data that he was supposed to figure things out. Pulaski turns up and is again bemused by people insisting that the robot-man is a person or something. She and Geordi make a bet to see if Data is capable of deductive reasoning. 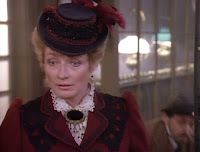 They all return to the holodeck in period costume (Pulaski's hat!). Data quickly figures out that the computer has merged a few Conan Doyle plots. Pulaski insists this isn't good enough, so Geordi tells the computer to create a worthy adversary for Data and purposefully sets no parameters - we will remember this later. The environment the holodeck becomes more sinister. One of the characters is able to see the arch and realises something is not right, he becomes Professor Moriarty. The Professor can access the Computer and, unrestrained by setting-based info, is able to make astonishing and unlikely leaps of logic. 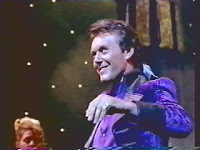 * He kidnaps Pulaski and gets Data to track him down. 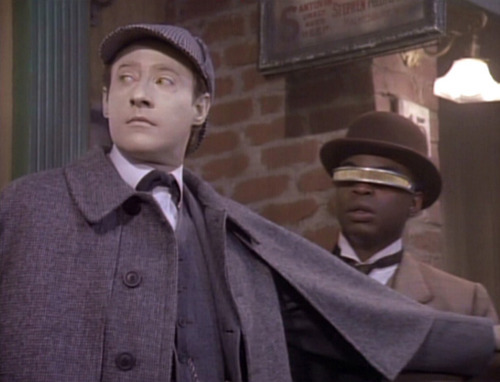 Data is horrified by Moriarty and tries to shut the holodeck down but can't. Moriarty has realised that he's in an artificial environment that's being carried inside something that looks like a turtle (as good a comparison as anything). Geodi and Data have to leave Pulaski and report the situation to Picard. Data reckons that the only way the Computer could fulfil Geordi's instructions was to create a self-aware character. 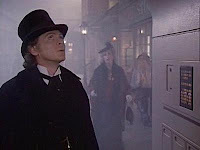 As they're figuring out what to do the ship wobbles, Moriarty uses a steam engine and lever to control the ship. 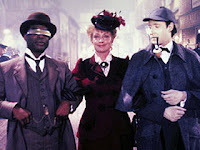 Picard dons a costume (including top hat and cane) and joins Data and Geordi in the holodeck. Moriarty, the criminal genius, feeds Pulaski tea (because that's what we do in the UK) and asks her questions. Picard is brought into the action when Data and Geordi realise that their game playing has become dangerous. Once the situation has been explored Picard dons hat and cane (yay!) and goes to confront Moriarty. Picard saves the day by having a discussion with Moriarty in which they speech at each other about definitions of life. Speeching is Picard's special skill, so Moriarty soon gives himself up, but Picard does the Right Thing and doesn't end his existence. Given how the episode started I did expect a bit more action, scheming or a greater battle of wills. It didn't seem to have much to do with deductive reasoning so much as just having a discussion. Data's attempt to have fun initially involves racing around a recreation of Holmes' study geeking out and quoting from the texts. Since I can't describe myself as a Conan Doyle fan (I've read a few Holmes stories and enjoyed them) this scene was perhaps not as thrilling to me as it might be to someone with a greater interest in the fictional detective. Data really gets into the role and assumes the kind of English accent that sounds like he should be wearing a monocle (at no point does he wear a monocle). 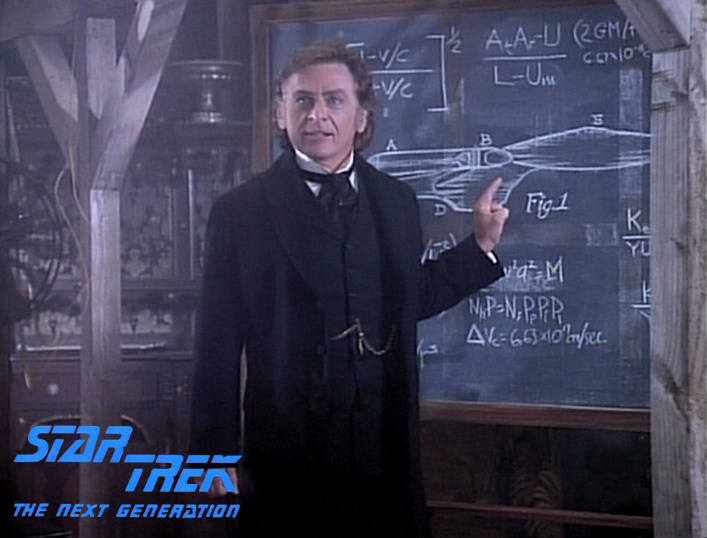 Data's knowledge of the source material means that he is able to solve the mystery in seconds. Data is alarmed when he realises Moriarty has become self-aware, and can access the arch and computer. Moriarty has a huge amount of information and has little difficulty understanding the reality of his situation. 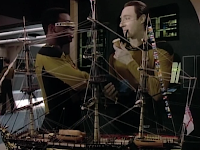 Geordi has spent time building a model ship as a present for someone we never see. Apparently Geordi has a lot of free time on his hands, though I guess he's now in charge of a huge staff of engineers. Maybe he's good at delegating. Geordi (like so many human Star Trek characters) has an overly-romantic fixation on the past. He is interested in naval history and ship design and goes on about wind and sails. 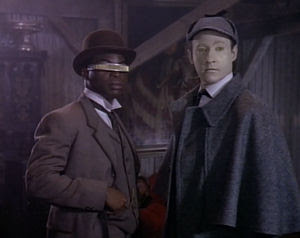 It's nice of Geordi to want to do something that Data will find fun, and the Holmes and Watson holodeck game shows how well he knows the android. However it's not surprising that Data's version of fun differs from the norm. Geordi tells Data he's been doing it wrong, even though that probably isn't Geordi's call to make. On the other hand you can tell that Geordi was really hoping for a chance to play. Making bets with Pulaski about whether Data is capable of deductive reasoning could be a sign of confidence in his friend, but also suggests that Geordi is just in a game playing mood. This may explain why Geordi gave the computer too much free reign in designing a game suitable for Data. Really this is all Geordi's fault, as Chief Engineer he should know what limits to set on Computer instructions. He should have made sure the mortality fail-safes were in tact, because that should be his first priority. At least Geordi acknowledges what he's done and apologises. Pulaski's bet, which never gets resolved, is a continuation of her scepticism about Data. I can understand that having a new character is a great opportunity to question Data's abilities, but she's starting to seem stubborn and short-sighted by continuing to ignore the assessment of the crew (and Starfleet) where Data is concerned. While Pulaski is Moriarty's captive there's a very weird dynamic between them. It's no surprise that he questions her and she won't answer. Him giving her tea fits with the genial, English villain archetype. He tells Data he'll harm her if necessary, but he shows no sign of this in his interactions with her, and seems almost fond of her. There's a weird sense that there's been flirting (or something) we haven't seen. Before Moriarty is about to be saved Pulaski comments that she may be an old woman when he sees her again, as if this is relevant. There's also the crumpets. Moriarty gives the Doctor crumpets. 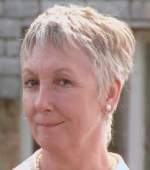 At one point she stands up unsteadily, hiccups and mentions 'being crammed full of crumpets'. I feel I should point out that crumpets should not be alcoholic. Moriarty later says something about filling her full of crumpets. The language used (cramming, filling) seems a bit dodgy, and I honestly wonder if there has been some misunderstanding about what crumpets actually are. You'd think that a thing called a mortality fail-safe should be rock-solid and not be capable of being circumvented. If they are, the Computer should confirm whether you really want to do that. I'm not sure how building a holodeck steam engine allows someone to control the ship, that seems like another thing that shouldn't happen. Things in the holodeck aren't real and shouldn't connect to moving parts, though I guess everything is computerised and that's what Moriarty has tapped into. I suspect the holodeck on the Enterprise has gotten too plumbed-in to other systems on the ship. It should operate more independently than it does. Data and Geordi tell the other main staff what happened. There's the usual discussion of tactics. Worf suggests an armed security response. Geordi comes up with a tech solution, but it's no good as it'll harm Pulaski. Troi senses something. Picard finally decides to get involved. Geordi's model ship was slightly damaged when Moriarty shook the Enterprise. Picard is fascinated by it, far more than Data was (Picard Likes Old Stuff). He introduces Geordi to the phrase "shipshape and Bristol-fashion", an old naval term. Something tells me that "Bristol-fashion" is not a French naval term (Fringlish). 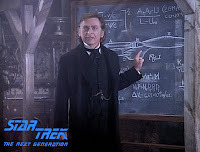 * This appears to be an artificial being displaying the very deductive reasoning that Pulaski is dubious Data has -suggesting that actually Data isn't that special. Later, Data will suggest that the Computer has given Moriarty consciousness, meaning that the Computer is ridiculously powerful and surely Data just needs an upgrade or something. This book is about Jeanne and Michael, 2 very different British teenagers. Jeanne is fiercely independent and extremely quirky. Michael is fairly mainstream and does what's expected of him. Jeanne and Michael have nothing in common (except that their exs have got together) and don't even like one another. The complication is that they keep kissing and neither knows why. This story is refreshing because, although it's largely about a relationship, it isn't saying that the person you go out with in your late teens is your tru love 4eva. It's not even saying that you have to have a huge spiritual or emotional connection to someone in order to be physically attracted to them. While I'm very much in favour of stable, supportive, romantic relationships (which isn't necessarily what one gets in the modern literature), that isn't everyone's experience. I sometimes wonder about whether all the YA books that talk about teens finding their soulmates aren't a little unrealistic and miss out/ignore aspects of romantic experience. The chapters alternate between Michael and Jeanne, so that the reader gets both sides of the story throughout the book. Both have issues, though Jeanne's are more problematic, and both treat (and think about) the other unfairly at points in the story. Initially Michael thinks Jeanne is ugly and weird, and Jeanne thinks Michael is boring and unimaginative, in both cases these assumptions are harsh. As they learn more about each other they become closer and more tolerant, but they are still very different people and we see the characters' petty weaknesses as well as their strengths. My husband unexpectedly got me a boxset of Jonathan Creek for Christmas, which was a nice surprise. 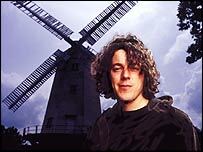 Jonathan Creek is a mystery show with comedic elements that was first aired on the BBC in 1997. Jonathan (played by Alan Davies) is a genius at lateral thinking and works as a trick designer for an egotistical magician. He gets drawn into various mysteries, at first by investigative journalist Madeline Magellan. The mysteries are intriguingly weird and sometimes seem impossible. Some of the comedic moments are also weird, or even absurd, and the chemistry between the main characters is good. The episode features neither wrestlers nor tombs, but it is the name of the victim's home. We meet Jonathan as a highly intelligent but awkward man who isn't much good with people or social cues. He manages to embarrass himself in front of Maddy, mostly due to not understanding someone with her personality. When it comes to problem solving he's much more comfortable and confident. Hedley Shale (played by former Doctor Who, Colin Baker). He's a well-known artist who painted strange yellow, clown-faced nudes, which are the images that open the show. He's married to powerful women's magazine editor, Serena Shale. Hedley was shot in the chest in his bedroom during a botched burglary. His mistress, a French model called Francesca, was bound and gagged. Having done all this, the thief dropped the gun at the scene and then dropped the stolen jewels in the garden. It was similar to a previous robbery, besides the amateurish mistakes. The gun had fresh prints but they didn't match anyone involved. Maddy (played by Caroline Quentin) is a brilliant character and the perfect foil for reserved, repressed Jonathan. She asks the questions the audience want to know, and gets understandably frustrated when the answers don't come. She's forthright and determined and entirely confident in herself both personally and professionally. There should be more characters on TV like Maddy. Maddy hears about the Shale murder via a police contact. She hacks into Francesca's answerphone (this is back when mobiles were brick-sized and phone hacking happened, but was less of a thing) and goes to Adam Klaus's show in order to meet her. Maddy gets talking to Francesca and eventually gets her side of the story. Maddy hears about Jonathan from Francesca and enlists his help. She poses as someone from Channel 4 in order to film Serena's office and later to get into her house. Serena Shale had motive to kill her adulterous husband. She was alone in her high rise office between 9:30am and lunchtime, Hedley was killed around 11:30am. After Maddie and Jonathan investigate the office, Jonathan even makes a scale model and little puppets of Serena and her assistant to demonstrate how Serena could have gotten out of her office unseen. Of course it's all nonsense and entirely impractical, as Jonathan himself points out, the model seems to have been an intellectual exercise. Adam Klaus is a self-centred, egotistical magician and Jonathan's boss. In this series he's played by Anthony Head, with a bad US accent and a pony tail. Adam sees Francesca in the audience and gets Jonathan to guide her through a disappearing trick. He gets into a relationship with Francesca and she becomes his new assistant. Spoilers and answers beneath the cut. 2012 started out positively and has seen some good times with good people. However I feel as though I've stalled a bit, especially towards the end of the year when things got on top of me a bit. I plan for 2013 to be better, and hopefully I can learn from some of the challenges of this year. I really need to be better at this. I think the main problem is that I'm a bit hard on myself. I don't spend time trying to do nice things for myself and I can also be a bit rubbish at socialising and getting in touch with friends. This resolution is about taking/making more opportunities for fun. Related to the previous point, being creative is fun. Especially when there isn't pressure associated with it. At the start of 2012 I planned to do more sewing, but I've hardly done any recently. I should do sewing and things like that more. I actually watch a fair bit of TV, it's a medium I enjoy and -sad though it may seem- I think it had quite a strong effect on me growing up. I watch about as much as I read, and I could talk about that more than I do. I wanted to do this in 2012, but despite a confident start I haven't been as proactive as I could have been. I've sought some help with job hunting and plan to be more focused next year. Get better at punctuation, sentence structure and grammar. These are things that don't come naturally to me. I tend to write in run on sentences and I'm a bit wary of semi-colons. I read a lot and I consider myself well educated; I got high marks in English, but there seemed to be a point when they stopped teaching certain technical things. I was able to do well without really understanding them properly. I'm not quite sure where to start with this. If anyone has any suggestions of helpful resources I'd appreciate it.